In this excerpt from The Paris Review interview with Haruki Murakami — bestselling author of The Wind-Up Bird Chronicle — the writer discusses the influence of hardboiled detective fiction on his work. INTERVIEWER: … hard-boiled American detective fiction has clearly been a valuable resource. When were you exposed to the genre and who turned you on to it? MURAKAMI: As a high-school student, I fell in love with crime novels. I was living in Kobe, which is a port city where many foreigners and sailors used to come and sell their paperbacks to the secondhand bookshops. I was poor, but I could buy paperbacks cheaply. I learned to read English from those books and that was so exciting. INTERVIEWER: What was the first book you read in English? MURAKAMI: The Name Is Archer, by Ross Macdonald. I learned a lot of things from those books. Once I started, I couldn’t stop. At the same time I also loved to read Tolstoyand Dostoevsky. Those books are also page-turners; they’re very long, but I couldn’t stop reading. So for me it’s the same thing, Dostoevsky and Raymond Chandler. Even now, my ideal for writing fiction is to put Dostoevsky and Chandler together in one book. That’s my goal. INTERVIEWER: At what age did you first read Kafka? MURAKAMI: When I was fifteen. I read The Castle; that was a great book. And The Trial. INTERVIEWER: That’s interesting. Both those novels were left unfinished, which of course means that they never resolve; your novels too—particularly your more recent books, like The Wind-Up Bird Chronicle—often seem to resist a resolution of the kind that the reader is perhaps expecting. Could that in any way be due to Kafka’s influence? MURAKAMI: Not solely. You’ve read Raymond Chandler, of course. His books don’t really offer conclusions. He might say, He is the killer, but it doesn’t matter to me who did it. There was a very interesting episode when Howard Hawks made a picture of The Big Sleep. Hawks couldn’t understand who killed the chauffeur, so he called Chandler and asked, and Chandler answered, I don’t care! Same for me. Conclusion means nothing at all. I don’t care who the killer is in The Brothers Karamazov. INTERVIEWER: And yet the desire to find out who killed the chauffeur is part of what makes The Big Sleep a page-turner. MURAKAMI: I myself, as I’m writing, don’t know who did it. The readers and I are on the same ground. When I start to write a story, I don’t know the conclusion at all and I don’t know what’s going to happen next. If there is a murder case as the first thing, I don’t know who the killer is. I write the book because I would like to find out. If I know who the killer is, there’s no purpose to writing the story. Read the rest of The Paris Review interview here. 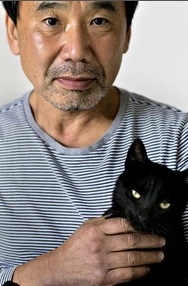 Photo: Haruki Murakami and cat friend.